Hi everyone–I thought I would insert a photo. Kathleen Krucoff is just teaching me, a very non-computer person, how to do this. So I thought I would share a photo that Jim Lawson, from West Chester, PA took of my mokume-gane. Jim is an excellent photographer, who makes your pieces “sing”. Please check out his site…it is amazing. I highly recommend him for jury slides and studio shots. He does all my photography for Lapidary Journal, and is quite reasonable. Plus, he’s just a really nice guy! Mokume-gane is a Japanese swordmaking technique, and this is composed of 27 layers of copper and brass for the bail, and 20 layers of copper and sterling for the bottom section. In the middle is a roller-milled textured piece of silver. The chain is a graduated Viking Chain knit, a labor intensive technique I learned from Sally Snow. I promise, making this 20 inch chain is enough to drive you to drink! Plus my hands really hurt when I finished it. So all together, this piece probably took about 24 hours to finish. So hope you enjoy the piece, and now that I know how to insert photos, my blogs will be a lot more colorful. Beautiful, Lexi! That chain is something else. I could never do anything like that. The mokume piece was composed of 3 different demos for my college class. The silver/copper piece I made from scratch in class, a labor intensive process, which ends with about 3-4 hours filing with a #0 file all the way down to 9 micron finishing film by 3M. (I did the filing at home.) That will leave a nice polished, very smooth finish on your mokume. The center silver piece was from an earlier demo on rollermill textures, and the bail was a piece of copper/brass from Reactive Metals, which I patterned in a class demo. It’s about $4-5.00 a square inch, and the silver is much more expensive. Its very rewarding to make your own mokume, but so time and effort consuming. Let me know if you want to tackle it, (evil grin here!!) and I’ll lead you through it. Gorgeous piece! I love making Viking knit – it’s the first thing I learned to make with wire. It’s what got me hooked on metal! I’ve made about 30 bracelets and a couple of necklaces out of Viking knit. Once you get your rhythm, it’s really a relaxing weave to make – for me anyway. Thank you Sandy. WOW! You have more patience than me. But you are right, there is a rhythm to it that is almost soothing. The drawing it thru the draw plate to make it graduated was difficult, and I’d love any tips you have on that. I have another one that is not graduated and was easier…of course, it was my second one. The only sad thing about the chain is there is virtually no FIRE involved, so unless I can solder I’m usually not happy. Soldering–creativity for pyromaniacs! Nice work! You’re lucky to have such a nice person as Kathleen teaching you. I’m sure you will have the computer stuff all sorted soon. It’s really such fun. Oh–Kathleen has made my life so wonderful and fun. She was at my house last night and even though I don’t think she learned a whole lot, we had a ball. She is one of my very favorite people in the world, and turning into a pretty fine designer and jeweler herself. Thanks for your reply. I’m glad you like the piece. I hope I am blogging in the right place here…..anyway I LOVE this piece! It is beautiful! I also am really enjoying reading The Torch. You are providing so many valuable insights and information! I am still planning on having a jewelry making set-up – after the New Year at this point – and have an outline of designs – but first need lots of PRACTICE! You are a very strong inspiration – thank you! Hi Jackie–It’s so good to hear from you. I hope you are getting everything set up from your recent move. If you need any help or information on tools, please don’t hesitate to give me a holler. I’ll be listing “Tools for a Beginning Jewelry Studio” very soon on my blog. If you need help with brands or places to purchase tools, let me know. Please keep in touch, and I hope to see you in Colorado soon. The piece is awesome, absolutely stunning. I use the Mokume Gane technique, modified, with polymer clay and love doing it. Do you have knowledge of instructions anywhere for the Viking knit? I would love to learn that. 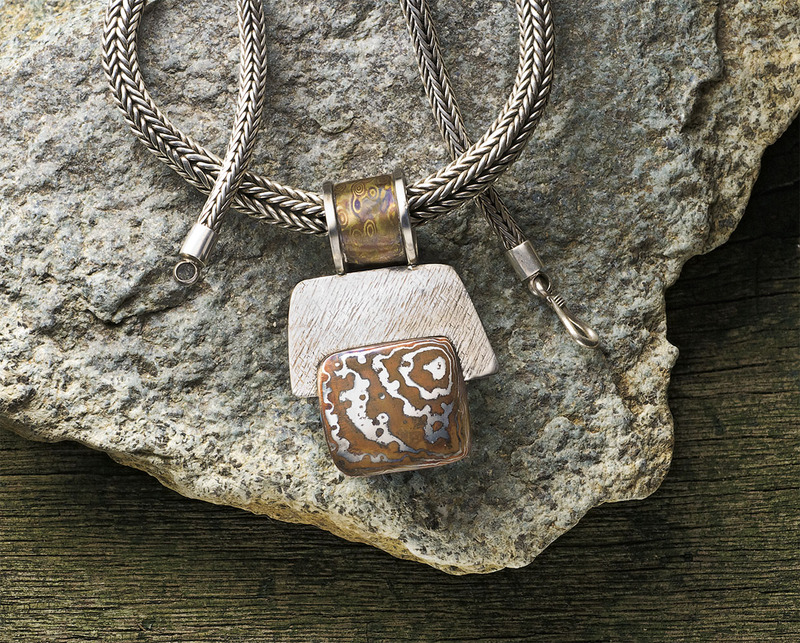 Hi Lynda–Thank you for the compliment on my mokume-gane piece. Mokme is a great technique, as you know from doing it in polymer. The techniques are the same, except in metal it takes hours of filing. As for the Viking Chain Knit, it is in almost every chain book, and directions are available on the internet. Most local bead shops have teachers who will teach it, and it’s variations. I loaned out my chain book, but will see if I can remember the author. Sally Snow taught me, here in Denver, but there are many teachers around. Keep in touch I may have more info for you.